The Inner Peace Garden was a conceptual garden space and was designed for the Gardening World Cup Competition staged in Japan. 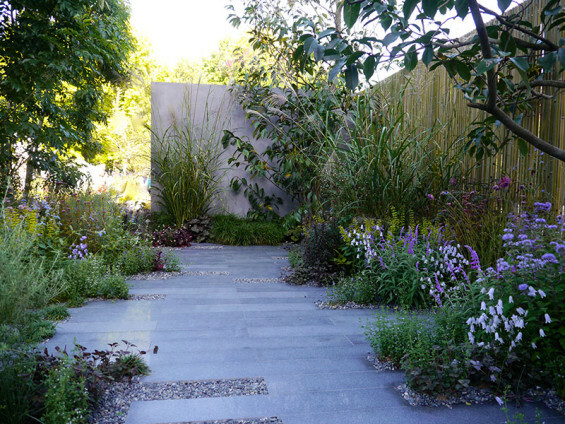 The garden was designed to be of a real size, 10m x 12m and be able to function as a usable space whilst conveying the idea of searching for inner peace. The space was used to convey the idea of travelling in ones mind to a place of peace and tranquility which allows thought and inspiration to come uninterrupted by the pressure and noise of everyday life. 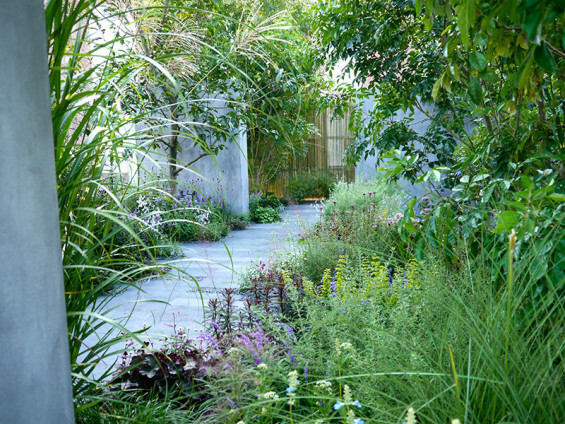 The Garden was surrounded by what appeared to be a confusing grid of upright concrete rendered walls and semi-transparent split bamboo walls intermixed with rich herbaceous planting and trees. 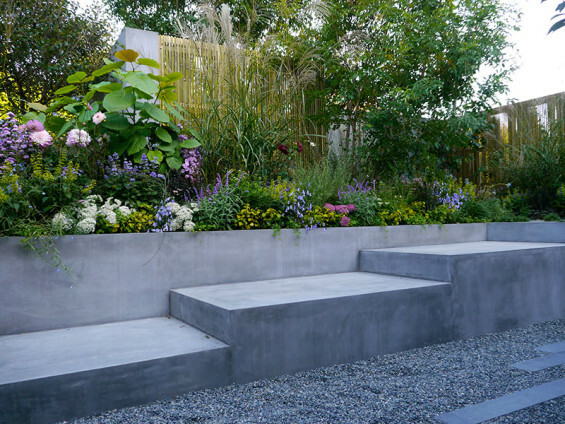 As you travelled around the outer perimeter of the garden the solid concrete walls provided cameo glances of small sections of a restful garden space which used colour particularly associated with calmness, however each also acted as a deflected vista giving the hint that further concentration and a wish to delve deeper into the garden may reveal more or offer the opportunity to be enveloped in the garden space. The Bamboo walls, whilst offering a block to a pathway into the garden also allowed stolen glimpses through and this was inspired by the way ones mind will often see ‘something in shadow’ requiring further concentration to reveal a full picture. The Bamboo screens had additional lighting installed inside so at night they provided a series of interesting shades across the smooth concrete walls. From one access point a path made of smooth linear granite sections leads into the garden. 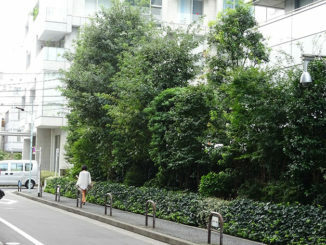 This path was designed to be slightly fragmented and in places difficult to navigate with plants spilling over. The width of each paving unit was just 150mm and in places only one piece was used. This resistance echoes the effort needed to pursue clarity of mind. 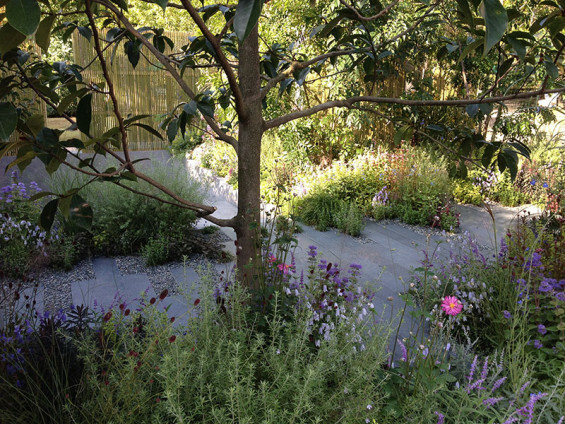 Once into the main body of the garden the path became easier to navigate and terminated in a blank concrete wall surrounded by deep beds of herbaceous plants in restful shades of purples, mauve and green. This symbolised the idea that sometimes we think we have come to a place of calm thinking in our minds but it is not always the case and a metaphorical wall appears and we need to consider other directions. It is when standing facing this blank wall that you are forced to turn around to move and then at one side a flight of steps hidden on the way in by clever planting reveals itself leading down into a sunken retreat. This again was designed to reflect the idea that sometimes inner calm does not come from the places we expect and like those calm places this space was designed to feel different to the rest upon entering it. 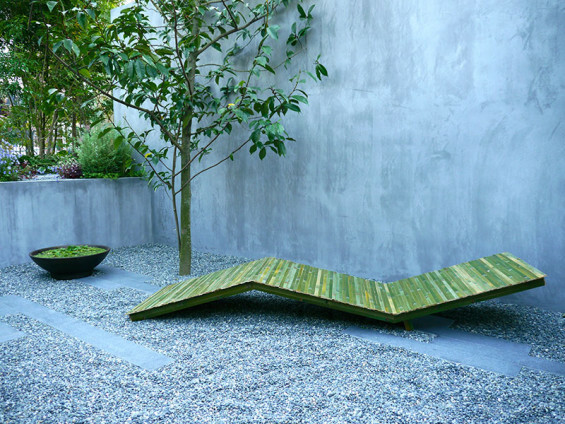 Unlike the rest of the garden this space was set 900mm below ground level and within it there was only a long bamboo lounger, made of the same material as the upright bamboo walls and minimal decoration in the paving. When sitting one could no longer see out to the everyday world or indeed the garden one has journeyed through. This lack of decoration and emptiness was designed to evoke the idea that inner peace requires no unneeded decoration or design clutter but is a place which is simple and laid bare. The garden won a Gold Medal along with the accolades ‘Best Planting’ and ‘Best in Show’ from an international committee of Judges.